Lord Jesus Come Quickly Discover the real Truth behind the "Alien/UFO" phenomenon. Are you ready for the Truth? The above quotation is the message that I personally received from the Lord in early 2009. At the time of receiving the message, I had not given the rapture too much prior thought. I had only been a saved true believer in Jesus Christ for a very short time. Furthermore, before this I had been raised in the Catholic Church that does not believe in the rapture event; only the second coming. The fact that it took me weeks to even realize the significance of the message that I received astonishes me now! I’m grateful to the Lord for entrusting me (and others) with the message that He has given me. For months prior to receiving the rapture message, I had personally filmed the “greys” for a period of three months. There is no middle man here. You are reading this directly from a person who has seen and filmed these evil spirits. I have been absolutely harassed by them: I’ve had crows following me around everywhere I went-I’ve felt these demons trying to get into my head-I’ve felt these demons crawling on my head area-I’ve seen their faces appear on the television and computer screens-I’ve been pulled out of my body on one occasion-I’ve heard them audibly speak etc. I can tell you for absolute certain that there are no so-called “aliens” whatsoever. As I’ve just stated, I have seen these evil beings-in fact I still see them to this very day–and I can tell you with all honesty-THEY ARE DEMONS! I have come to understand that it is my purpose to BOLDLY speak about the rapture and even more importantly-the deception that Satan already has in place to keep the deceived blinded and from choosing the only way to salvation- through Jesus Christ. The people who will disappear during this shocking and unprecedented event will not be random; they will be true believers in Jesus Christ. Notice the word “true” believers. I’m going to immediately address this issue because I could see a possible scenario where people who claimed to be Christians before the rapture would say, “Look. I’m still here!” This would just initially add to the confusion. There are many people around the world who claim to be Christians but they are not all true believers. These false Christians, who never were Christians at all, will be left behind like the rest of the unbelievers who never genuinely called upon Jesus to be saved. Remember, Judas had the appearance of being a Christian until his actions proved otherwise. In a similar way, the rapture event will prove beyond any shadow of a doubt who were the true believers in Jesus Christ and who had no genuine belief at all. The above verse shows that nobody knows when the rapture will occur. Those unbelievers who are left behind may not have accepted Jesus Christ before the rapture but they will not be completely lost. On the contrary, some will turn to Jesus to be saved post-rapture. Some will remember hearing about the rapture before it occurred-but had never previously called upon Jesus to be saved. Some may have known true believers in Christ and now repent. Some may have read this very article and not believed it! Others will believe the lies they are given after the rapture and unfortunately never come to Jesus-thus ending up separated from God the moment that they physically die and eternally tormented forever. How long will it take for some of those left behind to start to put the pieces together? This will be a chaotic event (to say the least) that many people will want to know the answer. What happened to the missing? Where did they go? The above verse is speaking about the true believers who will be caught up to be with the Lord in the air. Those left behind will be the ones who were in darkness and will be caught by surprise on the day of the rapture. Some will begin to see the common thread. They will start the process of elimination until they realize that it was true believers in Jesus Christ who disappeared. If it were just that simple-unbelievers connecting the dots-that only true Christians are missing; then I would estimate that many more would come to Jesus for forgiveness. However, Satan and his servants have some very well calculated plans to muddy the waters. Satan, with so many souls whom he has previously deceived over thousands of years and kept from the truth of Jesus Christ so that they might be saved- thus, those souls ending up eternally separated from God when they die-will be salivating like a lion ready to devour the billions upon billions more of unsaved souls after the rapture. Isn’t that sweet, our “space brothers” want to help us! They are going to lift some up with beams to their ships; but don’t worry if you’re not a part of the first evacuation. They even use phrases like “in the twinkling of an eye” which is used in the King James Bible (1 Corinthians 15:51-53). These are all lies folks. These are demons planting lies in their servant’s minds to explain the rapture before it even happens! The truth is that it will be Jesus! Wake up folks! This is real. Who will point the way to the truth of Jesus Christ when there is nobody on earth who believes it? Satan knows that initially there will be wide-open fields to harvest for himself without anyone standing in his way. It will be a chicken shoot! The post-rapture world will be the greatest potential for lost souls that Satan has ever seen at one moment in time and will ever see. Satan knows the Bible probably better than most Christians. There are many saved believers (pre-rapture) who do not believe in the rapture. Satan is certain that the rapture is going to occur- that is why he has laid the groundwork and has as much in place as possible to keep those lost souls…LOST! Furthermore, there are even saved true believers who are in the pre-rapture that hold onto the belief in the existence of possible “alien” life in the universe. It is not possible for these saved true believers to be deceived because they are already saved! There will be one group of true believers who will be correct and one group of true believers who will be wrong- what these people have in common is that they are still true believers in Jesus Christ and their sins have been forgiven. The people who should worry about being deceived because their very souls are in great danger will be those people left behind after the rapture occurs. Unfortunately, these unbelievers will be extremely vulnerable to the deception-and of course, most will probably not even know that their very soul is in a very real danger of ending up in hell for all eternity. What is the bottom line here? What is Satan’s motivation? The stakes could not be any higher. Mankind is made in the image of God and Satan wants to destroy all humans. Satan does not hold the keys to hell, but by keeping people away from the truth of Jesus Christ and blinded while they are alive- those people will end up in hell because they when they finally do physically die; they die in their sins. Jesus is the only way for all sin to be forgiven. There is no other way. Again, Jesus is the only way! When you consider all of the deceptions and false religions throughout the world; the gate truly is narrow- Jesus Christ is the gate. A person who foolishly bypasses and rejects Jesus- rejects the only way that would lead that person to salvation and therefore avoid eternal suffering and the absolutely horrific conscious experience of being separated from God forever and ever because they died in their sins. With the stakes having never been higher for the potential of billions of souls, Satan has cultivated the “alien” lie. Satan does not know the exact timing of the rapture but he will make an estimated guess; never knowing the precise timing for certain. However, with the “alien” and “UFO” lie being firmly in place before the rapture, those left behind have already been previously conditioned to readily accept the lie. With this lie already firmly in place, Satan doesn’t need to know the exact timing. One has to admit the somewhat brilliance of the satanic “alien” lie. Personally, I can’t think of a more perfect lie to explain the missing true believers. Not to mention that Satan has used the UFO lie over the years to clearly show how some abductees were being literally lifted into the air or “taken” by a beam of light coming from the “spacecraft”; and we’ve already seen evidence that this will be used from the previous “New Age” quotes. The head of the Vatican Observatory thinks there’s a good chance they do, and that their existence would be in keeping with the faith. Did the previous excerpt from the head of the Vatican Observatory-published on the official Catholic site- give you the chills? I think I have frostbite! If you previously did not see where this deception is going, do you now have an inkling of how disastrous this is really going to be? The Catholic Church is currently ready to accept Satan’s deception of “aliens.” They are on board (pun intended)! Again, did you read that title… “The Extraterrestrial Is My Brother” ? Their article is not some impulsive-thrown-together-after-thought of the Catholic Church. This is on their official site and this is their official position. The statements made were approved by the Catholic Church itself! Furthermore, as an ex-Catholic myself, I don’t think I was saved. I’m saved now praise Jesus! During the three decades I spent in the Catholic Church- nobody ever taught me how to be born-again! In my opinion, the Catholic Church does not teach ‘salvation through trusting in the finished work of Jesus Christ alone on our behalf’ correctly from the Bible and also adds works to attain one’s salvation; in fact, that’s a whole other article. What’s my point? Am I Catholic bashing? No! I love the Catholics and I want them to be saved by Jesus! Do you know how many Catholics there are in the world? According to the Vatican’s 2010 Statistical Yearbook of the Church, the number of Catholics in the world has risen over the last couple of years to an estimated total of 1.16 billion. Regardless of how many truly saved Catholics there really are, the fact is that the Catholic Church will still be around after the rapture. It’s possible to know right now by their position that they are going to prevent people from finding the truth behind the satanic deception. We are talking about millions upon millions of souls being deceived during the Tribulation period within the Catholic Church alone because of their disregard for the truth! Let’s rework their title for a brief moment and tell it like really is: Instead of “The Extraterrestrial Is My Brother,” it should read, “The Demon Is My Brother.” How terribly sad it is that millions upon millions of souls are in jeopardy and the groundwork for the satanic lie is already firmly in place beforehand. It is truly a tragedy. Satan has made his lie concerning “aliens” and “UFO’s” an embarrassing topic to discuss for most people-including the Church-with the exception of the Catholic Church because they apparently embrace their “Extraterrestrial Brother.” Think about the cleverness of this scheme. For the most part, people are scared to discuss the subject openly without having the fear of being seen as a “nutcase.” There is a definite stigma attached to this topic. In addition, due to the stigma attached to this subject-even most Christian churches that could be telling the truth on this topic and smashing this lie to pieces-stay away from this topic for the simple fear of having their reputations “tarnished”. Can you understand the structure of this lie? The churches, who would be the most important group to lead the lost to Jesus-are fearful to seriously touch the subject-or deceived! Most churches seem to avoid this entire subject like the plague. All the while, this lie plays continuously in the background. With that being said, there are some churches that expose this lie and my hat is definitely off to those few. I state that in all sincerity. Furthermore, I’m fairly convinced that the “world’s” governments will finally do a “full disclosure” on the “reality” and “existence” of extraterrestrials. The “full disclosure” could even happen before the rapture. This is mere speculation on my part. Satan does have his human servants as well-and it’s also mere speculation on my behalf that the government could also have some lightshow already planned for the skies during the time of the actual rapture-as unbelievable and evil as that may sound. The UFO believers will jump for joy thinking that they have finally pressured the government into telling the truth about what is going on. I know how it is, I used to be a UFO believer myself as well! These same UFO believers will think that they have actually won a victory for the truth about what has been “covered-up” for decades. In reality, these people will have fallen for the lie and have just gone one leap closer to ending up in hell for eternity because they would rather believe this lie than the truth of Jesus Christ. The scripture above basically shows that God will finally have enough of people rejecting the Truth of His Son Jesus Christ and therefore no longer stand in the way of these people clinging to their lies. One must remember that God is constantly trying to draw people to the TRUTH of Jesus Christ. If you study the scripture carefully- it clearly states the seriousness of falling for this lie during the Tribulation period because Satan’s lie will cause people to pass right over the actual truth of Jesus Christ- these same people will be damned forever because they have rejected the only way to heaven. In my opinion, the strong delusion will be “aliens” and “UFOs”. 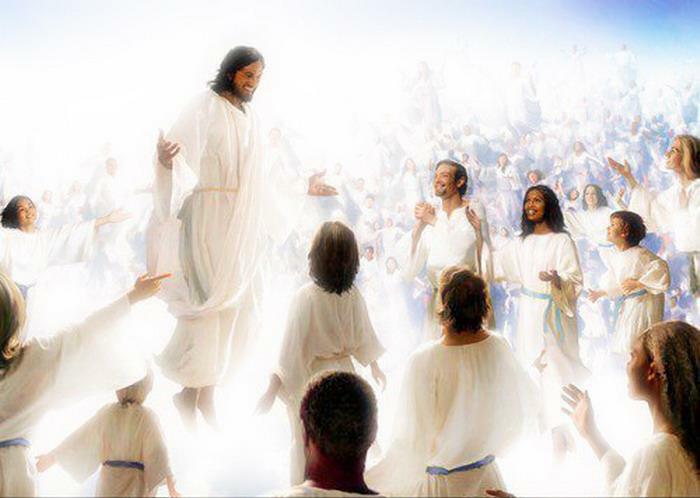 Finally, once the rapture occurs and the true believers leave the earth to be with Jesus forever, the good news is that there is still a chance for those left behind to be saved. The very important proof that some of those left behind can indeed still be saved is evidenced by Satan’s very need to lie about the true nature of the rapture. If those left behind could not be saved, then there would be no need whatsoever for Satan to painstakingly cultivate this lie over such a long period of time. Satan would already have these souls lost forever. However, the fact that Satan has developed this evil lie of “aliens,” proves that Satan himself knows full well that the people who are left behind will still have an opportunity to repent and believe in the Lord Jesus Christ to be saved. Does the concept of Aliens from ‘outer space’ conflict with your faith? Does it at least cast the ever so smallest amount of doubt? Can aliens co-exist with what we believe in the Bible or is it really one or the other? Is it Aliens really exist, but that’s alright because God created the universe and it’s possible that he created aliens and just didn’t really mention it clearly in the bible? Or is it either aliens exist, and I’ve been totally wrong believing in the bible, or aliens don’t exist..or maybe they exist but they’re misunderstood? Confusing isn’t it? With aliens and UFO sightings in the media on an almost daily basis now, I bet most of you reading have wondered at one time or another, or maybe you have come to your own conclusions. Certainly as a Christian, one has to either dismiss it completely or form another opinion. Or, be ‘open-minded’ like the world tells people to be these days. What I’m about to tell you is so shocking and so far-fetched, I can understand if you don’t believe me. What I’m about to tell you is strictly from my personal experiences only. Not the media. Not what I’ve seen on television. Not my own theory. I can assure you it’s completely true. I wouldn’t take the time to write this if it was lies. However, in the end, you will see my main message. My story begins. For decades I was conflicted like maybe some of you who are reading this right now. Sometimes I would think aliens existed. Other times I thought they did not. Overall though, I must say, I did believe they existed. There were too many credible witnesses to UFOs, some decent footage etc. This past summer I finally decided once and for all to find out if they are real or not. I feared being abducted at night. I decided to make it my mission to find out the truth, whether I liked it or not. Once and for all. Going so far as, if it proved to be real and the bible was not…so be it. At this time I was starting to think some of the stories in the bible were children’s stories anyway. How could Noah get all those animals to fit in the Ark?! I figured a good starting point was to find real footage. I thought that if these aliens really existed, then somebody must have caught them on tape. I searched for weeks. Most of it was fake footage. Then I found some interesting footage. It looked real. I watched it for weeks. I was pretty convinced that the footage was authentic. Something strange started happening (this is where I’m going to start losing some people). Crows started appearing in my yard, even though I’ve never seen a crow in my yard before. I started to notice them everywhere. My wife and I would go for walks, and the crows would almost seem to follow us around. I dismissed it for the most part. I had won a camcorder the previous December. I decided to see if I could capture the same footage that I thought was to be authentic on the Internet. By the way, on this other person’s footage the aliens looked like the grey aliens, with the black ‘almond’ eyes that are portrayed in pop culture these days. His footage was amazing. UFOs, hundreds of alien faces. It was really bizarre. So I go out with my camcorder and start trying to replicate this guy’s footage. The first night was impressive, but I can certainly see why some would say it’s not. So don’t run away yet! I filmed alien faces in the clouds the first night. Very distinct. Hundreds appeared..along with some other faces. One face had what I would call an evil grin. Well you can film anything in clouds! Yes. That’s why it gets better from here because that was the only cloud footage. I continued filming from that night (in my backyard by the way). I filmed the ‘grey’ aliens during the day! Right in my backyard. Dozens’ of them. They also had the ability to transform (or morph) in the leaves of trees into this ‘giant alien head’. As I started filming more and more, the footage got better! They even got closer! I started posting my clips for all to see. I had some people tell me it was the most amazing footage that they’ve seen! I figured out the technique on how to film them, and my footage kept getting better and better. One night I was filming, I got some crystal clear footage of ‘grey’ alien faces around lights. There were three grey alien heads in the air around lights. Another large (I mean three times the size) grey alien head on the ground, with another one right in front of it! The footage was so clear you could see the reflectiveness of their black eyes. One interesting detail, I could rarely ever see the entire body. Mostly just the classic grey alien head. Bizarre things began happening. I was getting a ‘sick’ feeling in my head and ringing in my ears. I could sense when they were close, and I had the urge to film them. It was beyond a ‘sick’ feeling really. They were trying to get into my head. They were indeed trying to possess me. I was constantly fighting it off. The crows were around my property like never before. I mean, they would fly upright outside my window. One weekend my wife and I traveled about four hours to motel. I had told my wife about the crows. When we pulled the car up to the entrance, I said “look Hun, look at the crows.” She said, “yeah”. Then she got out of the car and said,”Oh my. I didn’t know all of them were right there blocking our entrance to the stairway.” She was shocked that there were about 5 crows there,blocking us. The crow thing is clichéd, I know. But this really happened and I’m not going to omit it (Do I think crows are evil? No. But can they be controlled by evil. Yes. Absolutely). The filming continued. One of the final clips I took was really strange. What was seen in these clips really defied logic and what we know as reality. Anyway, one of my last clips was a UFO landed in my backyard with an alien figure in front of it. When I was looking for something to film that night, I didn’t see it at first. I figured out why. Because I couldn’t see it with my naked eye. I could only see it through the viewfinder of the camcorder. In fact, up until that point I never experienced it quite like this before. Let me explain, when I would film the alien faces they appeared frozen. Almost like they couldn’t move. With the alien in front of the UFO, it appeared to be moving. Let me just say, it takes guts or stupidity to film this in the first place, but this was terrifying. This time the alien looked like it was moving closer to me. I was probably about 80 feet away. I got up out of my chair and ran back into the house. I knew very early on what these were. And I can tell you for sure, this phenomenon does exist. But once you know it exists, then what are these aliens? Are they from another planet or what? The truth is far more sinister. Are you ready for this? They are demons. God showed me what they really were. How? Did he speak to me? Well, no, not exactly. God spoke to me how he speaks to many. I’ve heard other people try to describe it, and the best they can say is a ‘knowing’. And that’s the best way that I can describe it too. A “knowing”. No doubt whatsoever. Not a little doubt that they were really “aliens”. Not a speck of doubt. NO DOUBT. ZERO DOUBT. This is going on and these things are demons. Near the end, when you realize what you’re seeing is real, I started to come close to a nervous breakdown. It changed my life. I mean I ran to the Bible. I now know without a single doubt that the Bible is totally 100% true! And yes, all of the animals did fit on Noah’s Ark! I knew immediately that everything in the Bible happened and will happen. I was doubting Jesus Christ before this, not fully but experiencing some doubt, and let me tell you I have never believed in Jesus Christ this much in my life now! Jesus is totally real. The conclusion of my true story. What finally drove me over the edge was hundreds of “alien” faces appeared on my laptop screen. This happened a couple of times before that, but this final time drove me over the edge. I broke down. I prayed and prayed. I slept with a light on in the room one night. I knew hell was real. I knew demons were real. And I knew Satan is real. I met with a Pastor. I showed him my clips. He advised me to destroy them. I did. I erased every single one of them. They contained evil. I took his advice to spend my time on healthy Christian stuff than this garbage. And that’s all it is. The entire alien/UFO phenomenon is a lie, or ‘signs and wonders’ that will deceive. Praise Jesus, I was not deceived. That may not be the end of the deception either. Satan has been working on this major deception for hundreds of years. More information came to me months later, after I was being attacked. By the way, speaking of being spiritually attacked. If you want more evidence they weren’t aliens…why did the attacks stop when I began calling out to Jesus! The attacks have been much less and not even close to their severity since I’ve made Jesus Lord and Savior in my life. That’s also why I think the so-called “aliens” appeared frozen in the footage. I think they didn’t dare come closer because the Holy Spirit was protecting me. So finally, more information came to me. I also think that there is a good possibility that the “alien” lie will be the explanation for the rapture for non-believers.